So as you guys might have guessed, I am ALL about beautiful white gowns in the winter. 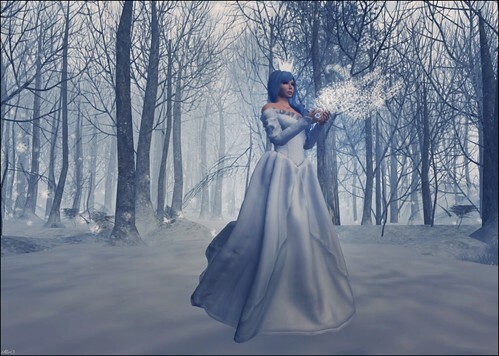 When I was chatting with Evie from Evie’s Closet about her new gown, the words “snow queen” and “Motherf—er” might have been said. I’m not saying which one of us said it, but … you know. But hello? Do I not look like a beautiful snow queen?? The Iseult gown is just beautiful. There are probably three designers on the grid that I feel do a really proper white for their gowns, and Evie is definitely one of them. Every detail is wonderful on this gown, from the textures to the bodice to the lace up arms. If you’re looking for a winter wedding gown or just a winter formal, this is it! I have to go prance around like the mothereffin’ snow queen I am. Happy shopping! I hope everyone is having a wonderful holiday season! Mine has been busy busy, hence the lack of blog posts lately. [“Yeah! Hence!”] But there are lots of awesome things hitting the grid, as I’m sure you guys are aware! Rebel Hope has an awesome dress for you winter brides out there! The Crystal gown comes in both white [as shown here] and cream, and has a pretty veil included. Truth finally hit us with some fantastic new hair last week, and I have been wearing the heck out of the new Dove hair! I am all about the side pony in my RL these days because my hair is so long, so it’s great to have a gorgeous side pony in world, too! If you haven’t been to FaMESHed yet this month, you need to go! Although you can only see a bit of it in this photo, the Winter Dream Gazebo from Pixel Mode is a must have for your winter decorating. I’m off to do more holiday shopping! The weather here has been icy and cold for so many days! I hate it, but I DO like getting cozy when it’s so very very cold! Fri.day has some cozy things for you this month, like the Cozy Flats from The Arcade! These are simply sweet little flats with a bow. Reminds me of something a Disney girl would wear! There are 14 colors to collect, 2 being rare. You will need the SLink flat bare feet since these are add-on shoes. Collabor88 started yesterday and Fri.day is also there with the Cozy Chair. I am in love with this chair right now because it also has a blanket that covers you up in some poses! I’m not using it here, obviously, so I can show off my shoes but as soon as I was done taking my picture, I covered right back up. I hope you all are staying warm and safe out there! FaMESHed and The Arcade are still going strong! IKON has released mesh eyes for FaMESHed! I’m wearing the Spectral eyes in blue. They’re easy to adjust to fit really any eye holes [I guess you’d call them eye holes??] and you get the sizes like you get with the regular IKON eyes. I am not SURE if you can wear two different colors, but I don’t see why you wouldn’t be able to. I’ve been wearing the Daisy hair by D!va for The Arcade probably since the moment I got my hands on it! It’s all messy and lovely and I think the stars on the headband are perfect for the holiday season. Of course, you CAN turn the stars off…but why would you want to? I hope everyone is staying warm and safe this weekend! Where I’m from, we don’t get a lot of snow. So when we DO get snow, it’s magical to me! Especially if it happens at night, when you’re just not sure if it’s snow or stars coming down. Rebel Hope has a gorgeous new gown at FaMESHed! Brandi is a mermaid style strapless gown that will be a huge hit at any fancy holiday party this season. And let me tell you, this dress gives you all KINDS of curves! My hips have never looked so full! But um, I’m pretty cold now, so I think it’s time to run inside and cover up! Oh my goodness, what a start to the month! Both The Arcade and FaMESHed opened with a huge bang today, and if you’re anything like me, you are in shopping heaven!! What Next is at The Arcade with these awesome Igloos! I’m standing in front of the Penguin igloo and isn’t it cute? There are some poses in it to sit on top of the igloo or lay down inside. Cute! But the poses didn’t show off my new First Snow hair and dress from Exile, also at The Arcade. The hair, hood, and dress are all one piece, and there is a HUD to change the color of the dress and one to do different shades of the hair. Mine is the Ice Blondes HUD and there are 10 lovely light blonde shades in this HUD. Mutresse is at FaMESHed with their new Sneja boots. Like everything else from Mutresse, these are really well done and of course very very customizable with the color HUD. I went all one color but you can change lots of things to make your boots match your outfits. Also at FaMESHed are the Fingerless Gloves from Kauna. They can be changed to either leather or wool, and there are sizes for both men and women. The hands, however, were a B to tint properly!! I am very used to having appliers now for my hands, so I’m definitely out of practice for tinting, but I could not get them to tint to match my skin at all, so I just kinda did what I could and let my windlight do the rest.